February’s Freeze . . . This morning began with single-digit temperatures despite a brilliant sun shining in a bright blue sky. Snow that fell two weeks ago remains frozen everywhere but the blacktop in the middle of the city’s streets. Another several inches are predicted to fall early next week. March shall arrive like a lion. Over the past few years I have found snowdrops and chickweed in bloom by this time. Last year, in fact, the title of my post for the month was “February’s Foliage” because green onion grass could be seen. No such flowering this season. Only ice and snow, snow and ice, with a cutting wind on bright sunny days such as today. 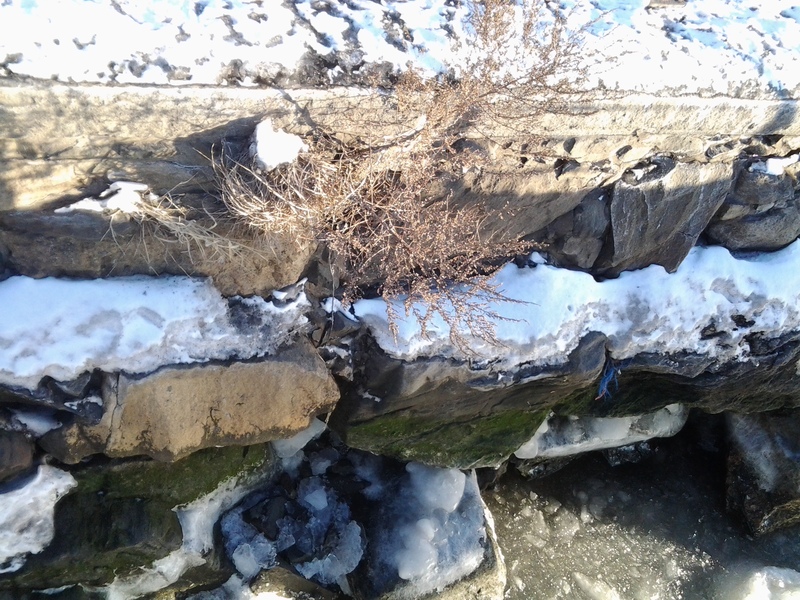 The closest encounter with a wildflower I made during this entire month of February was the sight of a single dried goldenrod clinging to a space between the stacked stone banks of the Hudson, which itself has been encrusted with ice everywhere but the shipping channel in the middle of the river’s flow.